Welcome to the October edition of Grand Giveaway! 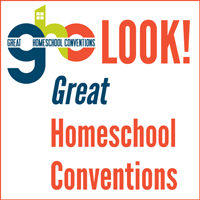 This month, our sponsor once again is Great Homeschool Conventions! I have never attended a convention. It’s on my things to do, someday. I’ve never attended a convention. I’ve just heard so many mixed reviews & we are on a stick budget that I’ve been reluctant to spend the money to go. I have not been to a convention and would love to attend this one! I’d like to go to the Greenville one. I’ve never been to it. I would very much like to attend the Midwest Convention. I think it would be very encouraging and informative….not to mention, just fun! I have not been the a big convention, but attended a small local gathering several years ago. I have not been to one yet. I have been to one homeschool conference, and it was amazing! This one has a couple of speakers I would very much love to hear speak! Thanks so much for offering this great giveaway! Yes, I have for the last several years. It is my much needed inspiration. I’ve never attended one, but this is also the first year I’m homeschooling. I have never been to a convention before. I would love to go!! I attended the one in Greenville in 2011 and it was fabulous. I can’t wait to go in 2013! I attended one smaller one where I live but would love to attend the big one! Yes! Going to conventions is one of my favorite things to do. We make it a date day for my Husband and I! I have been going to conventions since I was a teen, and I was being home educated! Now I am a 2nd-generation home-schooler, teaching our 6 children. We are now in our 8th year. I have only been to our local curriculum fair, not to anything this big! I’ve attended state conventions in Kansas and Tennessee, never a big convention though! is just beginning the homeschool journey. Never attended but would love to. I have not been to a convention yet. It would be such a blessing for us to be able to go to this this! I love convention! Always a refreshing way to get ready for next year and refocus! Nope, but it sounds neat! I’ve never been to a homeschool convention. I just started homeschooling 3 weeks ago! I have been wanting to go for several years! This would be great! Attending the Cincinnati convention changed so much of how I viewed homeschooling. It was a true blessing. I’ve never been to a convention & would love to go to the Southeastern conference. This is our 1st year homeschooling (9th grade). I have been a public school teacher for the past 17 years. I have been to convention several times. It has always been good ‘girl time’ but would like for DH to go this year.